Client Ratings Richard Widynowski has been rated by 50 clients. I love spending time with my family doing outdoor activities. A perfect summer day is enjoying camping with my family, a little fishing, exploring the area by foot or bike and a quick swim in the lake. At night we settle in by the campfire to tell stories on a warm summer night. Vacations with the family are always the highlight of the year. We love going to Fairmont where we enjoy biking, walking, tennis, swimming and some golf. 2009 was our first BIG trip to Disneyland with the girls. It was completely magical to experience the holiday through their eyes. With Princesses for 5 straight days, we even got to enjoy an Anaheim Mighty Ducks Hockey game. 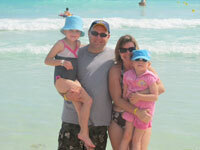 In 2010 we enjoyed the beach and the sun in the Mayan Riviera, Mexico. Everyone loved the sand, swimming and boogie boarding on the waves. The girls were excited to play cards and enjoy a few ‘fancy dinners and entertainment’ at night. In 2011 we flew to Florida to visit Disneyworld & Universal Studios. To our surprise, the biggest hit was meeting the X-Men at Universal Studios. Every summer we look forward to camping, fishing, biking around the neighbourhood and tennis filled evenings. After years of working as a loan/mortgage manager with Safeway Credit Union and then Wildrose Credit Union, I started my Real estate career in 1997. For 15 years I have enjoyed helping clients find that perfect house. I believe that a client knows the right house as soon as they enter it. With my relaxed sales approach, I try to inform, update and make my buyers feel comfortable with the making the right decision. Very professional. Made entire process very easy for us. Very happy with results. Richard Widynowski did a fantastic job. From start to finish Richard was the best I could have hoped for. There was never a feeling of being overwhelmed or pressure. If I had any questions he would answer to the best of his ability or find the answer I required. He went above and beyond his responsabilities on every level and helped my first time buyers experience remain stress and worry free as he was able. There is soo much to be said about someone who shows they care and they are there for you through the whole process. We are a young family who was forced to relocate to Edmonton after a challenging year in Fort McMurray. We tried several reputable realtors with little success, we started losing motivation . . . then we found Richard Widynowski. When you look for a realtor you want someone with strong customer service, technical inclination and business acumen. You also want someone with a great deal life experience. Richard offers all of this. He helped us snap up our dream home at an amazing price. When we sit in our new home, we feel blessed that we faced the challenges we did last year, because those challenges led to us finding Richard who helped us purchase our dream home. Thank you Richard and Liv Real Estate.